Del-Tron’s crossed roller tables are known for their high accuracy and exceptional load carrying capabilities. Our linear bearing crossed rollers are available in both aluminum and steel, and the perfect choice for applications where these criteria must be met. Accuracies range from 0.0001” per inch of travel straight line accuracy on our aluminum tables to 0.00008” of parallelism on our steel crossed roller tables and are capable of carrying loads in excess of 2600 lbs. Our aluminum crossed roller tables are available with both inch and metric mounting holes. You can choose from our low profile LPT series with its 3 rail design or opt for our Gold Motion series with its flanged base and 4 rail design. Both are available with stainless steel crossed roller rails and roller cages for applications where corrosion resistance is a requirement. For vertical applications or applications involving high acceleration or deceleration forces you may want to consider our Anti-Creep crossed roller tables. 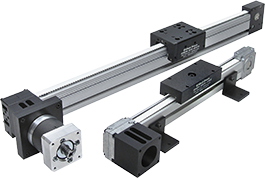 These linear bearing units employ a rail and roller cage design that eliminates roller cage migration or slippage due to load orientations or acceleration forces. Additional industry terms include linear bearings, linear motion bearings, linear slide bearings, roller tables, cross roller bearings, roller slides, and more generally as linear slides or motion slides.